I find inspiration from all sorts of things...but mostly vintage jewelry. I love the quality and construction of those oversized, over the top pieces you find at the local flea market. I also ask myself this question while designing, “if I were in a tropical paradise, with a beautiful bright printed dress with sun kissed skin...what piece of jewelry would I love to wear? ?” I am obsessed with color and I think it shows through in my designs. How could one look at hot pink or turquoise and not be happy?! I am really all over the place as far as planning my designs. I draw a lot of them...but sometimes, they literally pop in my head at the most inconvenient times (like 5:30 in the morning while getting ready for a photo shoot) and I have to run to my studio and start making it immediately! Some of my favorite designs are completely spontaneous. 2. What are some of the biggest trends you see in jewelry this season? 3. How did you begin to work as a jewelry designer? I believe the root of it started when I was very young. My grandmother had an amazing thrift shop that she would let me go through and take what I wanted (how lucky was I?) I would get bags of old costume jewelry and take apart the ones I didn’t like and reassemble the beads and chains into new pieces of jewelry to give to my friends. When I look back, it was obvious that I had a keen interest at a young age. I went to ECU for fine arts and fell in love with metal design- so I there I found myself making jewelry again. It is a perfect marriage of my passion for art and fashion! 4. What are some of your favorite materials to use in your jewelry? I incorporate a lot of Czech glass in my jewelry. That’s probably the number one material I use. I prefer glass over resin (aka plastic) because of the heavier weight, quality and the way glass feels on your skin vs. plastic. The downside to using glass is that it can be heavy...which is tricky with earrings! Other materials I like to use are Austrian crystal accents- they give just the right amount of sparkle to add that glam-factor without being overly formal. The Gracey bib necklace is one of my favorite pieces from Loren Hope Designs. 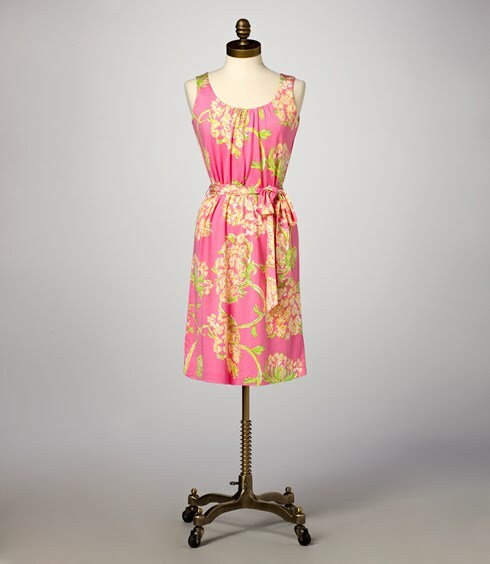 Wouldn't it look perfect with the Regan Maxi dress from Lilly Pulitzer? It's perfect for the beach getaway or beach portrait. Paired with an elegant straw hat, this ensemble is perfect for a day at the steeplechase or an outdoor event. Lilly Pulitzer's Blair dress pairs perfectly with Loren Hope Design's Nora bib necklace. Make a statement! Loren Hope Designs' Harper necklace adds a splash of fun and color to the new Cedar dress from Lilly Pulitzer's Summer 2010 collection. 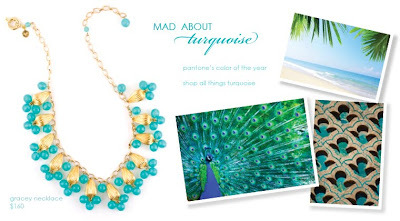 Another gorgeous turquoise piece from LHD is the Belize cluster necklace. Also available in pearl, this necklace makes an elegant compliment to your favorite Lilly dresses. This spring, I know that everyone is wild about the Multi Gator Patch pring. You'll get so many compliments on this necklace with the Lilly Pulitzer Cormick dress. When I'm traveling, I like to bring only a few pairs of shoes and jewelry that will match with most of my outfits. I tend to wear things from a certain color family so that I can maximize my packing. Loren Hope Designs' collection matches my Lilly wardrobe perfectly! Every season, I review the Lilly Pulitzer catalog in great detail. I look at the accessories that the models wear and try to find the non-Lilly items whenever possible. Loren Hope Designs is a natural compliment to Lilly and I hope to see her designs soon in a catalog!! Loren Hope Designs is sponsoring a VERY generous giveaway for Maryland Pink and Green readers. One lucky winner will receive a Gracey Bib necklace valued at $160! Leave one comment and tell me what you did and how many entries to give to you. As a special bonus for this fantastic giveaway, you'll also receive one additional vote for each person you refer to this giveaway. Your friend should identify you or your screen name in their comment after becoming a follower of Maryland Pink and Green. The entry possibilities are endless. Help spread the word about Loren Hope Designs! The contest ends on Saturday, April 24. The winning entry will be drawn at random and will be announced on Sunday, April 25. 4 entries!! Love that Belize necklace, and the others too, but I am more drawn to silver. Beautiful stuff!! this is incredible! I don't even know which one to pic, I love them all! thank you two for the giveaway! Beautiful stuff! Wow, I would pick the Belize cluster necklace in pearl and wear it with my black sundress! I am a fan of yours on facebook and just became a fan of Loren HOpe Designs! Wow, love this jewelry! I'm a follower, love the Belize Turquoise necklace most. And I would wear it with pretty sundresses, as well as with jeans and a simple white or black t-shirt. All of her jewelry would truly make an outfit pop! I've also become a fan of both you and Loren Hope Designs on fb. So that's 3 entries for me! I am a follower and I just love the knotted bead necklace in blue. Gorgeous jewelry. I love the Belize cluster necklace, but would have to give it to my daughter to wear with her white eyelet Lilly! I follow you and am a fan...so 3 entries for me! 1. Tweet this giveaway with a copy to @ilovelillymd- check! 2. Follow @lorenhopedesign on Twitter- check! Four entries for me! I retweeted, I'n a fan of both pages, and I follow LHD on Twitter. 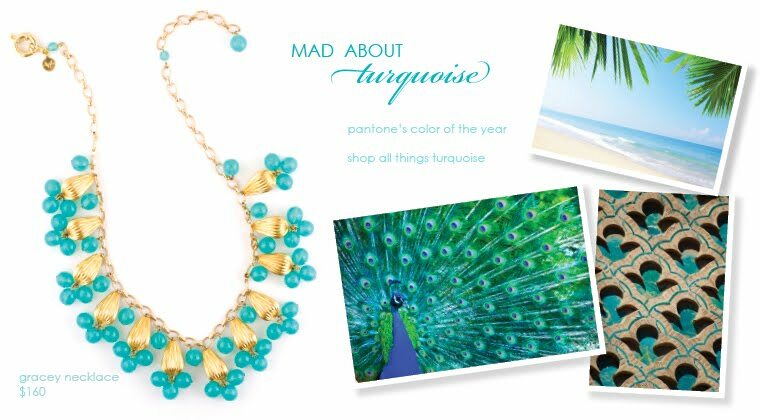 I love the Belize necklace, and actually anything in turqouise. I'm lucky to live in the southwest where there is lots of turquoise, but these designs have a gorgeous "twist". Beautiful! LOVE the Turquoise Belize cluster necklace- would look amazing with everything in my wardrobe, especially for dressing up cute summer dresses. wow! thank you for introducing loren-her work is amazing! love the belize cluster necklace + the flapper tassel necklace- which would look especially great with the avery skirt I am coveting for summer! Am also a FB fan of both of us and a blog follower- 4 entries total! I also love the Knotted Bead Necklace- Olive ! :) It's gorgeous! Thank you so much for this awesome giveaway!!!! My favorite piece is the Belize cluster pearl necklace. It is absolutely BEAUTIFUL. I think it would look great paired with a little black dress and some small pearl studs. I also am following @lorenhopedesign on Twitter. What a great giveaway! I love the Belize cluster necklace as shown and have the perfect white LP halter dress to pair it with!! I have also followed all the other steps and believe that would be 7 entries. Is my math right?! Good luck to everyone. Also, I tagged you on my blog for an award! What a fabulous giveaway. Bethany, you never cease to amaze!! What pretty baubles. My favorite piece is the coral Harper earrings. I think they'd look great with just about any white top. Thank you both for the giveaway! How fun! And how fabulous is Loren and her jewelry? Simply divine and perfectly paired with Lilly. I'm a fan of yours on facebook, I'm now a fan of Loren Hope on fb, and I wrote about your giveaway on my blog: 3 entries for me pretty please! Oh & I'm a follower of course! My favorite piece is definitely the Nora Bib Necklace... I would love to pair that with a pair of jeans, a simple white shirt, gold jack rogers, and a coral colored bag. Love the Knotted Bead Necklace in Blue! I love the Belize necklace in pearl! I could wear that SOOOO many ways. It would be perfect with this season's it color, turquoise. Wouldn't a turquoise top, white jeans, and this necklace be perfect at the beach? And this could top the LBD with perfection. It's so versatile, and I appreciate you introducing me to this jewelry line! I also tweeted this giveaway, am a fan of both of you on FB, and follow both of you on twitter. I think that earns me 6 entries! it's all beautiful but I am loving the Nora bib necklace in coral! You can pair it with a sundress or let it stand out against a white T and denim boyfriend shorts after a day at the beach. 2 entries fro me, Bethany! What beautiful things! The Harper necklace is my favorite! I would wear it with a crisp white button down. Absolutely lovely!! 4 entries for me, please. One entry for me!! I love the belize cluster, perfectly paired with a white sundress for Mothers Day brunch!! Love the Belize cluster. I JUST biught the Cormick dress. What a great combo! Happy weekend to you and hugs to the minnies!! Hope your mom is well. Her jewelry is gorgeous! How exciting! I love Loren Hope Designs! I hope I win this necklace! is my favorite. Thank you! 2. I am a fan of Loren Hope Designs on facebook. 3. I am a fan of Maryland Pink and green on facebook. 2) My favorite is the Belize Cluster Necklace in Pearl. I think it would look great with my Lilly Pulitzer Regency bubble dress!!! 1. My favorite is the Gracey Bib necklace. It would match tons of my Lilly. 2. Already a FB fan of Loren Hope Designs. 1. I am now a Loren Hope Facebook Fan! 2. I am a Maryland Pink & Green Facebook Fan! 3. I 'HAVE' to have that Turquoise bib necklace to go with my linen strapless jumpsuit. So cute! What a great giveaway. Her jewelry is beautiful and unique. I love her Belize Cluster Earrings and pair them with several Lilly pieces that have that color in them. I posted about this great giveaway on the sidebar of my blog. Yeah, that gives me two entries. I posted on my blog (tallahasseean.blogspot.com), shared on facebook, I am a follower of both @ilovelillymd and @lorenhopedesigns, and retweeted to my followers (@fmdjewelry). I love jewelry - making it, wearing it, and sharing it with others! Thanks for the amazing give-away! 1. 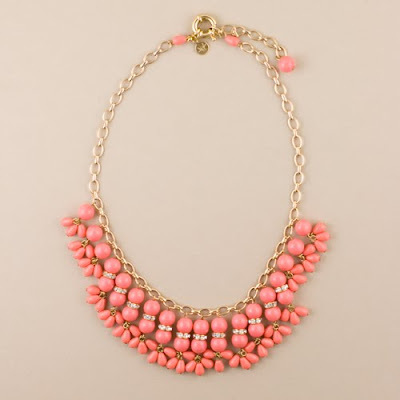 I am a follower and I would love the gracey bib necklace, it would look great with white!! I love them all- seriously. The harper may be my fav. I am a fan of both and a follower of you. I think that's 3 for me! What an amazing giveaway! Beautiful jewelry! I love the Gracey Bib necklace and would wear it with a long black or white sundress - with turquoise sandals! My favorite is the Gracey Bib Necklace in Black-I would wear it with everything! I am a facebook fan of you and Lauren Hope Designs and I shared the giveaway on my facebook profile so 4 entries please! I love all of Loren Hope jewelry! I especially LOVE the Gracey Bib necklace! I would wear this with my J.Crew Silk chiffon Whitney gown for my wedding in Tulum, Mexico on 10.10.10! It would be so perfect! I am a fan of Maryland Pink and green! Beautiful jewelry, all of it! :-) I love the Gracie bib necklace, would wear with my new Regan in Gator Alley, as well as the Regan maxi in white that I plan to purchase very soon!